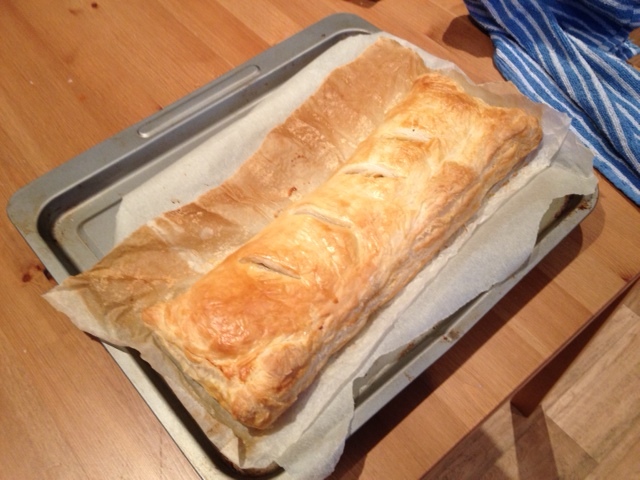 As promised I have finally written my post about the giant sausage roll! This was amazing and a total monster in size – it fed us for two Dinners and a lunch! 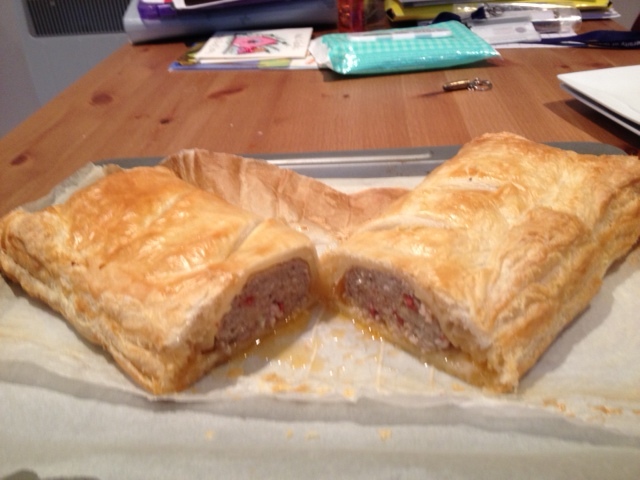 It’s somewhere crossed between a sausage roll and a family sized sausage plait! Oil/Liquid issues aside, this was a seriously easy thing to make – yes I did buy the pastry – I didn’t have time to make my own pastry too. I just bought a pastry sheet (asda’s own!) and laid in out on a baking tray on some grease-proof paper. I then mixed together some chopped up pepperoni pieces and apple cubes with a pack of sausage meat. I then spread it down on one half of the pastry (avoiding the very ends and a small strip down the side so I could press and crimp it together) and folded the other half of the pastry on top! 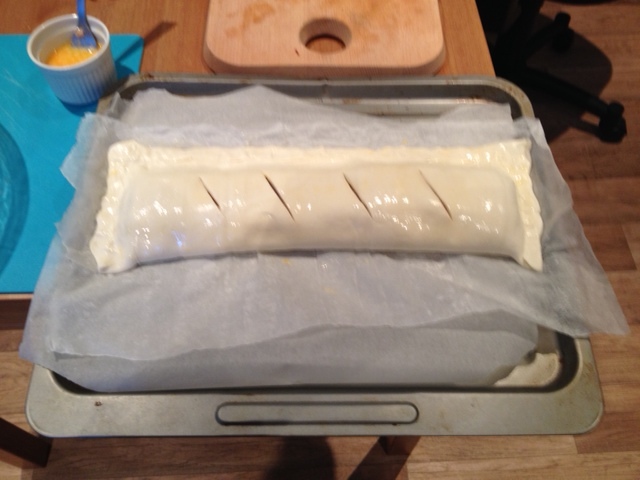 A little bit of crimping and pressing down at the edges to keep all that tasty filling locked away, a couple of slashes in the top to let out the steam – and this puppy was ready to hit the oven. (I did put a little egg wash on this one but this is optional – the second one I made didn’t and was just as good) Like I said before this lasted us a few meals as we cut it into six and had a slice for lunch, a slice with vegetables and so on. These sausages were made my Heck a company that specialises in making.. well.. “damn good sausages!”. You can find their website here. 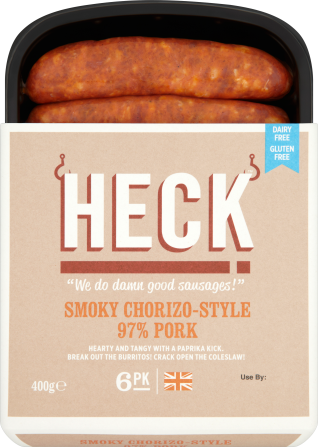 I have to be honest I hadn’t heard of this company before and bought them mainly because they were 97% pork, but since finding out that this company is a good old independent – it’s a product I will definitely be seeking out and trying again. I don’t think I’ve ever seen a sausage that’s 97% before – so many sausages are filled with rusk and fillers to pad them out – but not these! These particular ones were chorizo style. Now these were not chorizo sausages like you would find in tapas or in a ring, these were sausages with all the kick and flavour of a chorizo with that normal sausage texture. I ended up using these for my sausage roll, I cut open the skins and emptied out the sausage meat and mixing that with the apple. This was definitely a revelation and had all the smoky flavour i’d wanted for the original effort but this time.. NO SOGGY BOTTOM! These sausages didn’t release anywhere near as much fat or oil and I think it says how good it was when I tell you this one did not last three meals. If you see these sausages in your local supermarket – give them a go! I’m definitely going to seek out this brand when I next go shopping and it’s definitely worth paying a few pennies extra to know you’re getting great ingredients and not just bulking agents..